I will cut to the chase and tell you to go En Japanese Dining Bar at River Valley for their 50% promotion off Sushi and Sashimi from 6pm – 8pm daily. The prices of the ala carte menu are similar to other Japanese Restaurants in Singapore. But it makes a whole lot of difference when you factor in the 50% discount off sushi and sashimi. Forget about the other Japanese casual dining restaurants, go to En Japanese Dining Bar’s for their 50% Early Bird Promotion. It was a table full of food that night. We had Sashimi Platter, Maki rolls, Pork Belly (picture below), Sushi Platter, Soba and Black Sesame Ice Cream. By the way, En Japanese Dining Bar’s menu is not restricted to just Sushi and Sashimi. They have a good selection of Grilled Dishes, Tempura, Salad and Appetisers too. We started with the Nigiri Platter ($23.80 before 50% discount) with 8 pieces of Sushi. Up next was the California Maki ($10 before 50% discount) which was nicely placed on an elongated white plate. Even without the 50% discount, I think it is good value considering that it comes at $10 for a platter of 6 Maki rolls. Where else can you find a California Maki Platter at just $5++? This is incredible. Other selections on the Maki menu includes Soft Shell Crab Roll, Tuna Roll, and Salmon Avocado Roll (prices range from $4.80 to $12 before 50% discount). Sashimi fans will definitely order the Sashimi Go Ten Mori ($34.50 before 50% discount) with five different kinds of sashimi. If you have a big group of friends, go for the Sashimi platter with seven different sashimi ($47.50 before 50% discount). 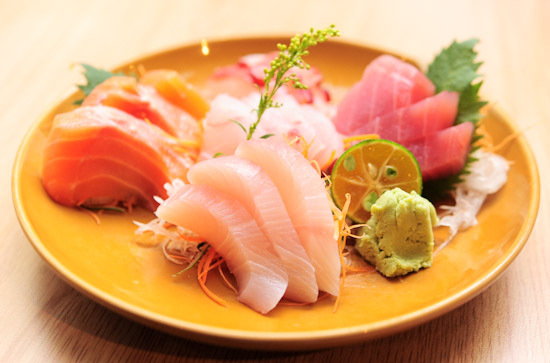 Otherwise, the individual Sashimi options are available too. En Japanese Dining Bar is a great reasonably priced Japanese Casual Dining Restaurant to satisfy your Japanese Food cravings. Do note that the food promotion of 50% discount off Sushi & Sashimi is only available at their Mohamed Sultan branch (River Valley road). For those who cannot make it for the early bird discount from 6pm to 8pm, you can go there for supper as the Mohamaed Sultan branch opens till late night 3am on Friday and Saturday. En Japanese Dining Bar has another branch at Bukit Timah and they have a different promotion of Japanese Hotplate Buffet at $48++/pax. Service at the Japanese Restaurant was quite poor during our visit. Their staff were not very knowledgeable about the menu, and they missed out one of our orders. But I guess we can’t complain since they have such a good promotion. This is going to be my new favourite place for cheap and good Japanese food… Unless you guys make it too crowded! For more recommendations, read my list of Japanese Restaurants in Singapore. their beef carpaccio is my favourite! I will certainly go there to vonfirm what I read. I am a Japanese Dushi & Sashimi Craze. Anywhere that serves good, cheap & nice Japanese Sushi & Sashimi, please inform me. Thanks.